Short Story is right. It's super short. It has an erie Ghost of Christmas Future thing going on with it too. There's a happy ending, and it made me think about how I'm too hard on my husband sometimes. Merry Christmas! The reason for downloading this FREE e-book though is really for the 1st chapter in Sophie Kinsella's new book out in February! I've Got Your Number! She is laugh out loud! I can not wait for this new book. 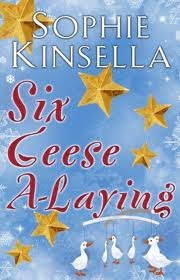 Kinsella is one of my very favorite authors. A free Christmas Sophie? Why don't I own this yet?